It’s finally here! 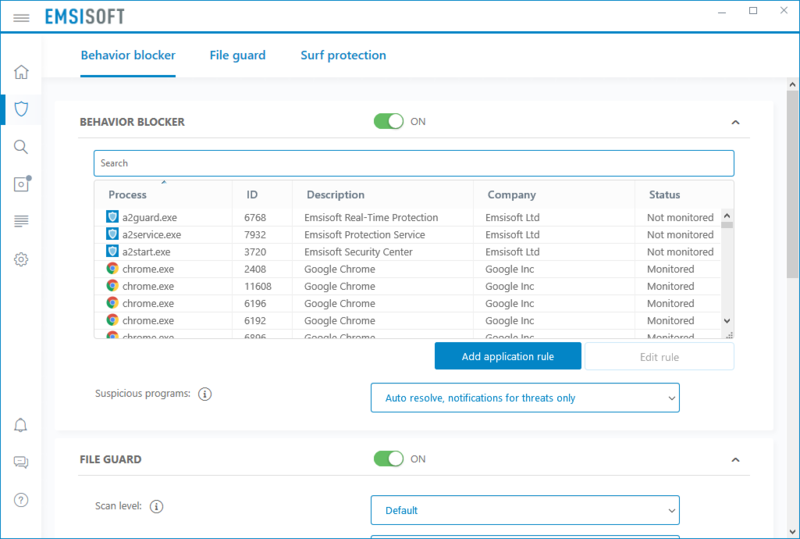 Introducing the redesigned Emsisoft Anti-Malware interface. 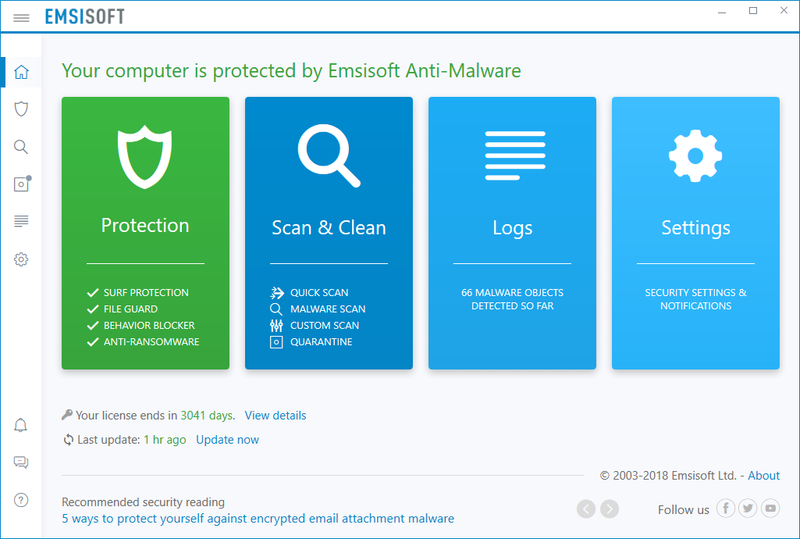 More than just a new look, the updated Emsisoft Anti-Malware interface was redesigned with you in mind. Don’t worry, we kept all the functionalities you know and love, while we made it more user-friendly and upgraded optimization for the latest Windows machines. The menu was moved from the top to the left side. That design pattern follows Microsoft’s new guidelines for Windows and web applications and has become common practice in recent years. It makes better use of wide screens and allows for more flexibility in terms of menu content items. Using the new hamburger button at the left top (three horizontal lines symbol), you can also collapse the menu to a slim icon-only bar to keep it as compact as possible. The new user interface is able to dynamically adapt to your available screen size for optimized readability. Dark mode is not in this update, but it’s definitely on top of our to-do list for one of the upcoming releases – stay tuned! Moved the main menu from top to left. Redesigned and re-arranged content panels. Improved access to About panel. The post New in 2018.8: Redesigned user interface for improved usability appeared first on Emsisoft | Security Blog. I can just confirm my many years feelings about Emsisoft. 8 years paid customer, I tried many security solutions, but always I was back to home, to Emsisoft product. Same protection is using everybody from my family and friends on my recommendations and never heard, somebody has any problems. Emsisoft is simply unique choice for strong protection, without any bloatware and useles things inside. Just renewed my old licences to next year few days ago on PC and Mobile. On Android is Emsisoft deeply recommending worth to try, this is also great made product. Looks easy to use GUI wise, newer customers to the product will look to be at home with the new design. Protection of Emsisoft has always been top notch! I am planning to give it a try soon. The internet security version discontinued? This uses Windows Firewall right? There is no firewall, you can use any firewall with this that you prefer including Windows firewall. emisi does not intervene in the behavior of Windows firewall, it monitors change of rules by software. I am not used to UI which has been changed still. Scroll by swimming with the mouse on the left side and the upper side of the interface .... It is similar to the impression that the push switch and the slide lever are lined up side by side. Has anyone tryed what happens on EAM installed Windows 10 system with Windows Firewall when malware tries to disable it? If behaviour blocker doesn't react on such actions, then I see no point even revisiting Emsisoft, even with their claims to monitor suspicious Firewall rule changes. If malware sucessfully disables it it's game over. to do that it means the malware managed to run, which shouldn't happen because the BB would prevent it. shouldn't happen because the BB would prevent it. Disabling the Windows Firewall is covered by the BB as well.